A pedestrian sustained serious injuries on Thursday morning after being hit by a taxi cab on Elgin Street. The paramedics report that the woman in her 60s was standing on the sidewalk when the cab hit her after 9 AM. She was taken to the hospital with serious injuries. The woman was found in cardiac arrest at the scene but revived by the paramedics. The paramedics began aggressive resuscitation with CPR and airway management. This managed to restart her heart. The paramedics began aggressive resuscitation with CPR and airway management. The cab driver who was in his 50s was being treated for a medical emergency. It is uncertain whether he was suffering from the condition before the crash. He is presently in a serious condition in a healthcare facility. It might have been a heart condition, so paramedics conducted several tests including an ECG and vital signs to figure out the cause. The passenger in the taxi was given treatment for minor chest injuries due to the seatbelt. He is given treatment on scene and transported to the healthcare facility as a precaution. Without warning, emergencies can occur. 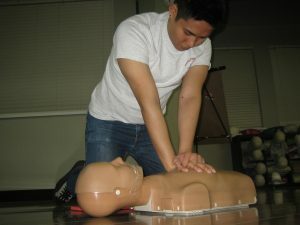 Due to this, it is vital to be familiar with essential life-saving skills. By enrolling in a first aid and CPR course, you will learn the basics to help save others during emergencies.